It’s normal for tires to become worn over time, especially after a few New England winters, but irregular wear may force you to replace a tire sooner rather than later. Regularly checking the tread depth and wear condition of each tire on your car can help you maximize the value of your tires and help you detect other maintenance needs. This is a common cause of unusual wear. When tires are improperly inflated, they tend to wear more rapidly and unevenly. When vehicle manufacturers specify the inflation pressures for the front and rear tires to optimize handling, comfort, and fuel economy, they also consider tire wear. If the tire pressure is too low, or even too high, the contact patch of the tire tread is not optimized to handle the wide variety of jobs it is asked to do. 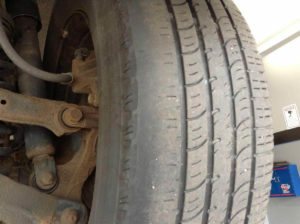 You should check the pressure in all of your tires, including the spare, every month. It’s also a good idea to check it before going on a long trip or when you plan to carry an exceptionally heavy load. You can usually find the vehicle manufacturer’s tire pressure specifications on a placard/label affixed to the driver’s door or along the door jam, or you can look it up your owner’s manual. Tire alignment, also called wheel alignment, is the adjustment of the vehicle’s steering and suspension components, which connects and controls the motion of the wheels. It is not an adjustment of the tires or wheels themselves. The key to proper alignment is to adjust the angles of the tires and their contact with the road according to the manufacturer’s specifications for camber, toe, and caster. If the alignment is off or incorrect, your tires can wear unevenly and prematurely. Maintaining a good set of tires, and replacing them when necessary, will help keep you safe on the road. Concerned about your tires? Call us today at (413) 314-2280 or schedule an appointment online.